A strong Magnitude 5.4 earthquake has struck in the dangerous Cascadia Subduction Zone in the Pacific Ocean just off the coast of northern California. The quake too place at an extremely shallow depth of only 5km. The Cascadia Subduction Zone (CSZ) "megathrust" fault is a 1,000 km long dipping fault that stretches from Northern Vancouver Island to Cape Mendocino California. It separates the Juan de Fuca and North America plates. New Juan de Fuca plate is created offshore along the Juan de Fuca ridge. The Juan de Fuca plate moves toward, and eventually is shoved beneath, the continent (North American plate). At depths shallower than 30 km or so, the CSZ is locked by friction while strain slowly builds up as the subduction forces act, until the fault's frictional strength is exceeded and the rocks slip past each other along the fault in a "megathrust" earthquake. The fault's frictional properties change with depth, such that immediately below the locked part is a strip (the "Transition Zone") that slides in "slow slip events" that slip a few cm every dozen months or so. This relieves the plate boundary stresses there, but adds to the stress on the locked part of the fault. Below the transition zone geodetic evidence suggests that the fault slides continuously and silently at long term plate slip rate. From its surface trace offshore to a depth of possibly 5 km, all remote from land, observations are few and it remains unknown whether the fault is stuck or slipping silently. Great Subduction Zone earthquakes are the largest earthquakes in the world, and are the only source zones that can produce earthquakes greater than M8.5. The CSZ has produced magnitude 9.0 or greater earthquakes in the past, and undoubtedly will in the future. Seismologists know that how long an earthquake lasts is a decent proxy for its magnitude. The 1989 earthquake in Loma Prieta, California, which killed sixty-three people and caused six billion dollars’ worth of damage, lasted about fifteen seconds and had a magnitude of 6.9. A thirty-second earthquake generally has a magnitude in the mid-sevens. A minute-long quake is in the high sevens, a two-minute quake has entered the eights, and a three-minute quake is in the high eights. By four minutes, an earthquake has hit magnitude 9.0. The last known megathrust earthquake in the northwest was in January, 1700, just over 300 years ago. Geological evidence indicates that such great earthquakes have occurred at least seven times in the last 3,500 years, a return interval of 400 to 600 years. To learn more about the history of the Cascadia Subduction Zone and the science that led to the discovery of it, delve into land level changes and turbidites created by the CSZ earthquakes. 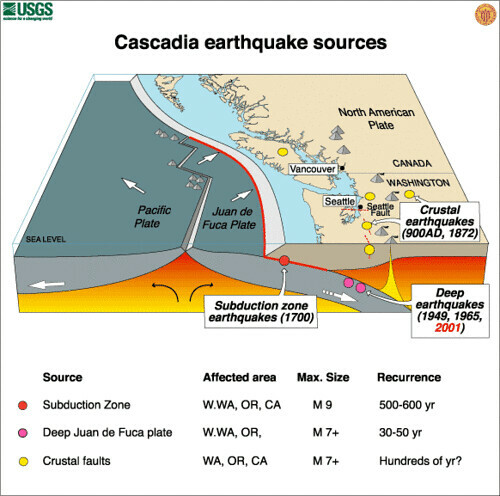 For more about the Cascadia Subduction Zone, visit the USGS webpage discussing this topic. The CSZ may be unique among the worlds subduction zones in that it produces very few (if any) earthquakes unambiguously on the plate interface. Coupled with evident occurrence of great megathrust earthquakes, the CSZ must be much more strongly locked than other subduction faults. The geological evidence has led to different interpretrations, moreover, about whether the entire CSZ always ruptures in great M9 earthquakes, or whether smaller M8 or M8.5-sized events also can break parts of the zone in between the full rupture events. The M9 Project, a University of Washington-based research group, has been producing research on Cascadia Subduction Zone hazards and effects of large earthquakes in the Paciifc Northwest since 2015. For their most recent publications and news, visit their website. If and when "The Big One" takes place, Federal Emergency Management Agency (FEMA) experts say the damage from the quake and the ensuing Tsunami from the Ocean, will "wipe out everything on the coast west of Highway I-5. To have today's 5.4 earthquake take place in this area is a major incident. It can serve to release pressure . . . OR . . . . it can serve to destabilize the whole CSZ setting the stage for "the Big One." 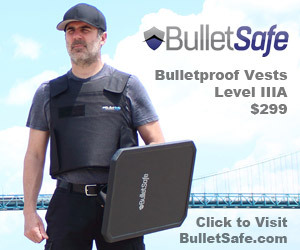 No one knows which result is happening. People along the US and CANADA west coast are advised to be ready for an emergency by having food, water, medicine, and fuel stored in case.